Adirondack chairs always feel like summer to me. Don’t you agree? You have inspired me to work on my yard and patio this weekend. I totally do agree – but I have had trouble, in my “old age” of 66, getting down into them and even more trouble getting back up out of them! They are just too low for us creaky old folks… I wish they made them “higher” up for the “handicapped” among us! I love that stone filled glass-top table, though. Wouldn’t like to be the one to have to move it around, though! HA! I am already experiencing my first taste of what you mean. :-) They are charming though! I love the look of the chairs also, reminds me of my Aunt’s home up in Catskill in NY. We would visit in the summer and the life was easy and she even had a wood burning stove. 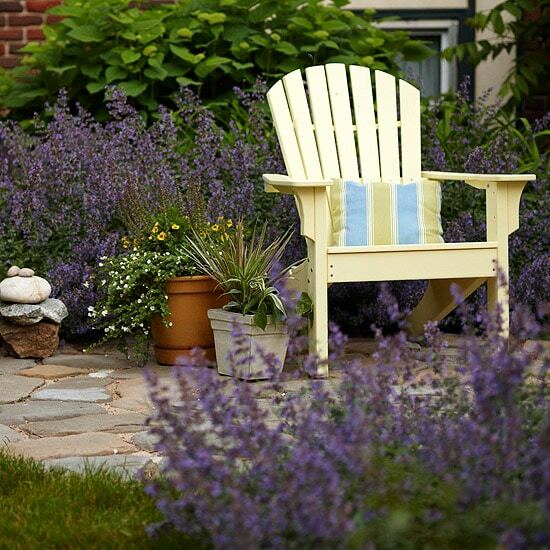 I loved it there and every time I see Adirondack chairs it makes me smile and remember a lot of fun summers. Once again, your timing is great. 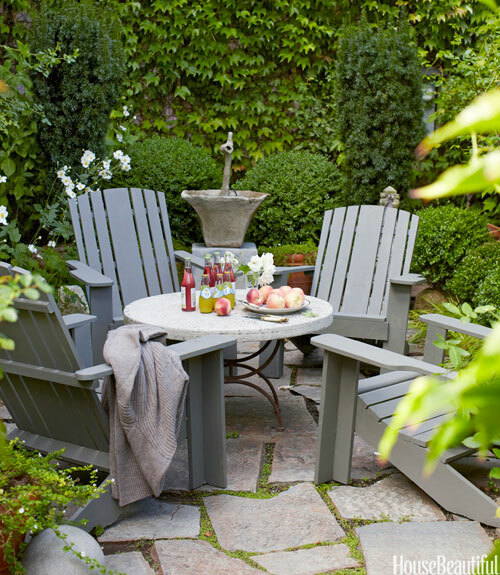 Just as I was considering replacing my Adirondack Chairs that I’ve had for 10 years, in hopes of acquiring a lower maintenance duo, I see that not only do I not have to worry about a flawless coat of white each year, the furniture and accessories around them don’t have to match perfectly. Ahhh. You just saved me a days work. I too love Adirondack chairs. When I sit in one, I instantly get the summertime lazies…a good thing. I find them comfortable as is…but yesterday I saw at Cost Plus an all in one Adirondack chair pad…back and seat. Oh so comfy. That grey setting is awwwwww! Inspiring! As well as the water feature of uniqueness. Beautiful summer that inspires the best from you. You’d probably laugh if you saw my encounter with Adirondack chairs. When I moved into my home in Dec 2012, I found quite large bedrooms, guest as well as master, that offered room for a comfy chair in which to sit and read (and additionally I needed one really comfy chair in which to sleep on those rare occasions when one needs to sleep pretty much sitting up). I was cash poor. with no budget for chairs and no time to look for just the right thing. Walked into Home Depot for other stuff and outside the door were stacks of resin Adirondack chairs in several colors, $18.00 a chair. Got 2 in a taupey grey and I was half set. Bex was right about them being impossibly low to get in and out of, and they can be hard on the bottom. So off I went looking for a cushion. Lowe’s came through with something they called a high-back chair cushion (1 piece-2 sections) in a wildly fun print with flowers on one side and stripes on the other in great colors including deep aqua that blended with my antique blue secretary and rusty red that picked up the red and tan Chevron blanket on the bed plus all matched a favorite print on the wall. And the cushion was nicely thick. I’ve since found a lovely sophisticated and streamlined “recliner” for my master, but the guest bedroom chair will stay for the time being. Although the room is not coastal (I’m in the Arizona desert – though I could do coastal if I wanted to), a country comfy and casual look is what I was going for and it’s what I’ve got and I be delighted to stay there myself. The second chair is out on the patio now and I’ll be checking Cost Plus and Lowe’s again for cushions for that one once temps drop back to something below triple digits and maybe something below the 90’s.. Sounds like a fun look for a guest room! I hope things cool down enough for you to sit in your chair outside, eek that sounds dreadfully hot! Oh I have wanted some Adirondack Chairs for years now, but can’t ever find the “right” ones in the right price range. 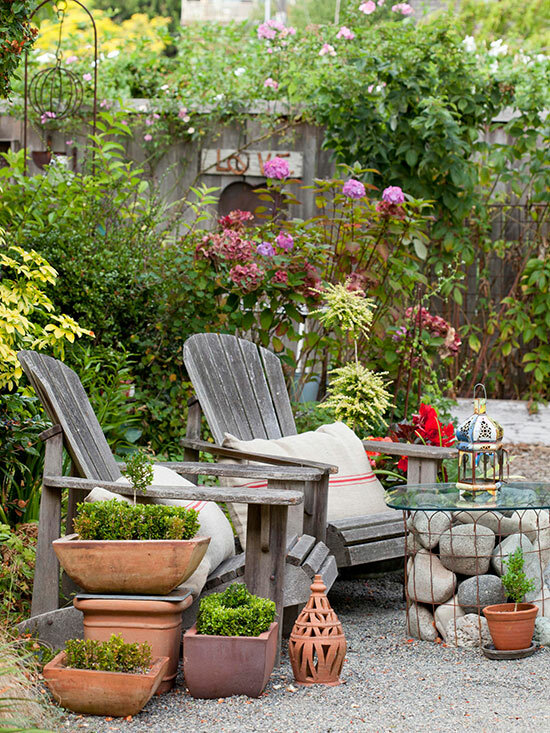 I love how relaxed they are…perfect for a fire pit! Hi Melissa, I bought one of these in about November last year (here in Australia) which needed to be put together, and which my nephew helped me do in my sitting room. Turned out, he likes sitting in it so much, it has never made it OUT of my sitting room, and into the yard. It seems to have become a permanent part of my decor LOL! Oooooooh. I am in love with that rock table! !